Who doesn&apos;t love ice cream? Even if you&apos;re lactose intolerant, you may be one of the 41% of Americans who prefer the cold, creamy treat. And with National Ice Cream Day coming up soon (July 16th), we thought we would treat our Haymeadow Apartment residents to a FREE sweet treat, courtesy of Culver&apos;s of Peoria (Holiday Drive)! And if you want some, we&apos;re gonna make it real simple for ya&apos;. Each morning from now until July 16th, visit our Facebook page (@HaymeadowApts) where we will ask "What is Culver&apos;s &apos;Flavor of the day&apos;?" Then you leave us a comment on what that day&apos;s "flavor" is! Boom! That easy. We will randomly draw names from correct entries to win a FREE treat from Culver&apos;s (while supplies last). Good luck! Oh wait... But, how will you know what the "Flavor of the Day" is? 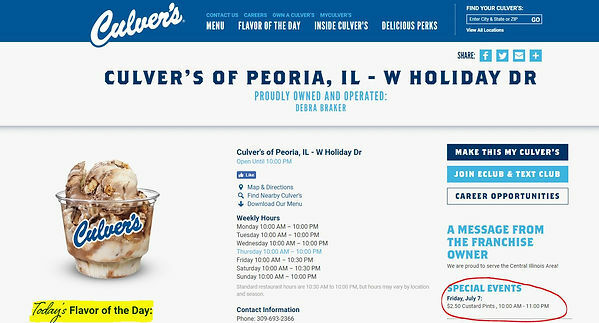 Follow the link we will post (often) to visit Culver&apos;s of Peoria&apos;s website. On the left side of the page, about halfway down you will see "Flavor of the Day"! And while you&apos;re there, check out their "Special Events" going on too. You might find a good deal! Of course, there are rules and restrictions. Click HERE for contest rules. Thank you to our friends at Culver&apos;s of Peoria (Holiday Drive), just across from Grand Prairie in Peoria.